Mark Zuckerberg unveiled Thursday in California, the new newsfeed social network, taking the form of a "personalized newspaper", which will be available to run from fixed and mobile devices. A main page and topical main sections, leaving the choice to each of the subjects he wants to search. This is a summary of what was said Mark Zuckerberg, CEO and founder of social network Facebook, Calif., when the expected announcement of the new layout of Facebook News Feed. "What we try to do is to give every person in the world the best newspaper personality possible. "Has he said. 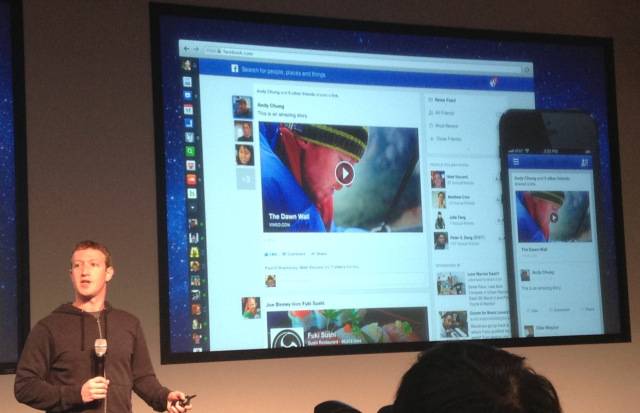 Facebook had already revised the presentation of the "timeline" (Journal), launched in late 2011. Therefore lacked a little update, also its newsfeed. This new version will include more value visual content: photos and videos. A statement from the American company also added that page will be redesigned news feed "to reduce clutter and focus more on the stories of the people" to which users are interested. The installation of this new feature will be slowly on computers and laptops, first, then on mobiles and tablets. All these materials should provide a common interface for the sake of uniformity. Divided into three sections, the newsfeed offer left access to all the basic functionality of Facebook in the center, we find the "wall" and right bar chat and online friends. The new update is launched to enhance the business pages, and allow more revenue through advertising. For example, when a user clicks "Like" on the page of a brand's profile picture and cover image will appear on the newsfeed of their friends.